The 19th century was the golden age for the Swiss spas. People crowded to the pearl of spa resorts. Its salt waters were reputed to be helpful in the treatment of more than fifty ailments, including rheumatism, osteoarthritis and anaemia. To bring the salt water to Swiss spas, more than two hundred years ago, an aqueduct measuring 7,500 metres was constructed of larch wood. Toward 1820 Grand Hôtel des Bains was opened and later, in 1871, the Hôtel des Salines. In 1882, a lead pipe brought sulphurous waters directly from the Coulat tunnel to the Baths at Hôtel des Salines. For local external applications, salt has beneficial properties, notably against inflammation of the throat and nose. Salt water (brine) frees the clogged nose and decongestions the mucous membranes. Salt water baths have also demonstrated their effectiveness over the centuries. Baths in salt water are useful notably in the successful treatment of rheumatism, sciatica, gout, accidental injuries, after-effects of paralysis, gynaecological problems, heart problems, respiratory tract diseases and various skin complaints. The salts used in therapeutic baths are on sale in pharmacies, but their use is recommended only after consulting a specialist, and always scrupulously keeping to the prescribed dose. Salt can be found in many bath and cosmetic products. 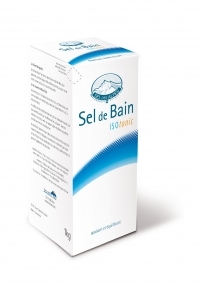 Sel des Alpes® is an essential ingredient in our wellness products. Free from pollution, it offers your skin the purest form of care. This salt is extracted from the heart of the Alps of Vaud, from a deposit that was formed when the sea covering Switzerland 200 million years ago evaporated. It was later buried under the mountains at the time when the Alps were formed. 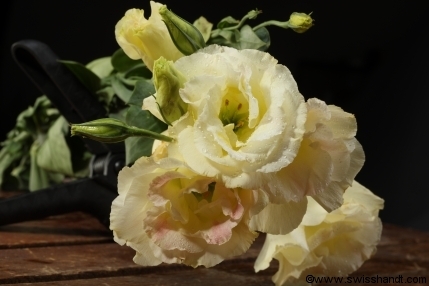 Since then, it has maintained its purity and original richness. This salt is extracted from its deposit by dissolution in pure spring water, coming from the Anzeindaz Glacier, which is then evaporated. Its crystallization in round balls, with a diameter between 0.1 and 0.5 mm, makes it an ideal base substance for all types of treatments, including peelings and other applications. It easily dissolves in water. Especially suitable for baths, peelings, or other wellness applications, it is also used as a raw material in crafts and the cosmetic industry. This salt, although not intended as human food, is classified food grade quality. - You'll never want to leave your bath! 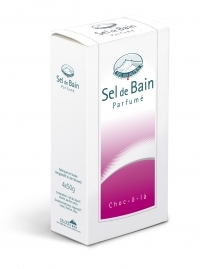 Sel des Alpes® is completely free from pollutants. Thanks to its purity and balance, these perfumed bath soaks leave the skin feeling soft and silky. In keeping with Chinese tradition, osmanthus has long been used in Asia to create a deliciously delicate tea. Discover the magic of our Lemania bath soak with its delightfully subtle hint of the Orient. Savour our delicious new bath soak - Choc-ô-là. Luxuriate in the sweet smell of chocolates, spices and fruits. Oxygène with its blend of fresh mint and energising citrus fruits will stimulate and purify your senses. Revive body and mind with an invigorating and refreshing bath. Their non-foaming formula makes them suitable for use in hot tubs. Aimed at the most discriminating customer, our essential oil bath soaks are free of preservatives and chemicals. Extracted from the very heart of the Swiss Alps, Sel des Alpes® is rich in minerals and free from pollution. 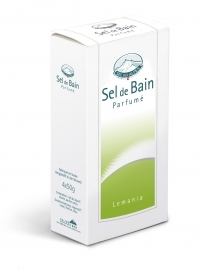 Combined with essential oils, our Sel des Alpes® bath soaks will offer you a wonderfully natural experience. 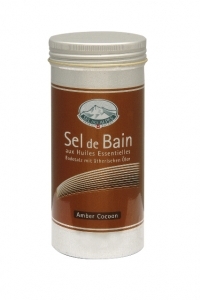 Amber Cocoon is a bath salt containing essential oils that has been specially developed for people who long new experiences. With its suave fragrance, and entrancingly soft, sweet note created from a subtle blend of essential oils of Ylang Ylang and Cardamom, it will without the shadow of a doubt bring a spicy note tou your evenings. Recyclable aluminium container - 400g (+/- 8 baths). Blue Forest is a subtle blend of essential oils of Pine and also Juniper. It has been created for those who lovers of ou mountains aud nature. With its invigorating and very fresh fragrance, it will give you energy, and provide you harmony and well-being. Energising bath soak with an invigorating and revitalising blend of mint and rosemary. Refreshing and purifying bath soak. Sprinkle two handfuls of salt into your bath water. Wait five minutes before soaking up this well-earned break. You will feel re-energised and ready to rediscover your lust for life. - For beautiful silky-smooth skin! 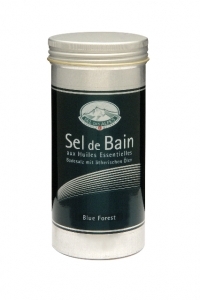 Sel des Alpes® is used by wellness centers and luxury spas for body scrubs with a revitalizing, long lasting effect. A massage before your shower or bath with this scrub containing Sel des Alpes® crystals renews skin cells and activates circulation. Acerola is a natural source of Vitamin C, acts as an antioxidant, and helps neutralize harmful free radicals; it is an important substance that exfoliates the skin’s surface for a smoother appearance and invigorated cells. In addition to Vitamin C, Acerola contains minerals and Bioflavonoids.Associated with the strong hydrating qualities of glycerin, this fruit extract reduces skin imperfections related to environmental influences and aging. Its advantage: a fruity scent of fresh cherries. Men's skin is constantly exposed to the natural elements. The new body scrub for Men enriched with Malachite and Sel des Alpes® helps alleviate this problem. Thanks to its active ingredients, it reduces free radicals and helps the skin maintain its natural defenses in order to fight against harmful environmental influences. Its advantage: A scent of wild strawberries. The Edelweiss extract is a real anti-aging complex (anti-inflammatory, antioxidant) that helps soften the skin. It neutralizes free radicals, thus strengthening collagen fibers and protecting the skin perfectly against exposure to environmental influences. Thanks to its properties, the Edelweiss extract is an ideal ingredient for the treatment of sensitive and exposed skin. Its advantage: a smooth scent of Bourbon Vanilla. 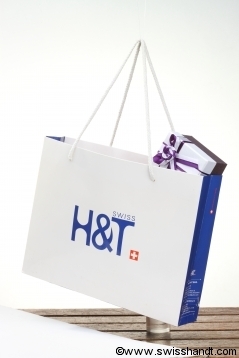 The benefits gained from salt bathing therapy in spa centers have been known for many years in Switzerland. With ''Isotonic bath salts'', one can benefit from these rich minerals at home. 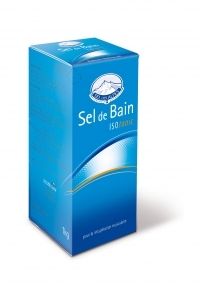 Similar to a physiological serum, an isotonic bath is obtained by adding 1 kilogram of the Sel des Alpes® to a full bath tub. This creates the ideal conditions for osmotic exchange. These bath salts ease muscle recovery and prevent stiffness, while offering a relaxing experience.